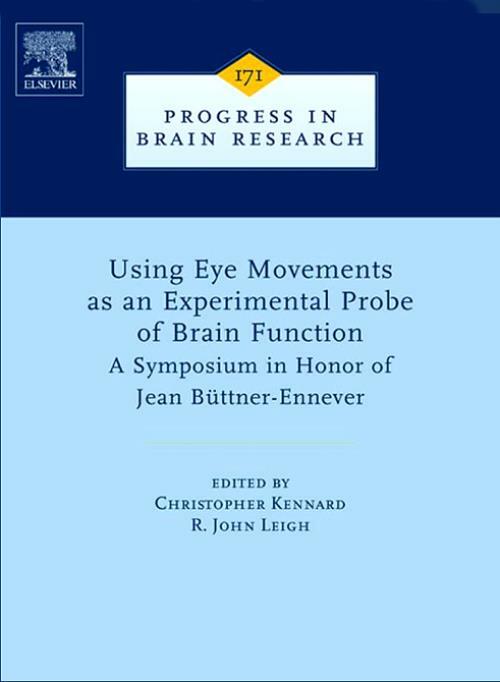 This volume of Progress in Brain Research is based on the proceedings of a conference, "Using Eye Movements as an Experimental Probe of Brain Function," held at the Charing Cross Hospital Campus of Imperial College London, UK on 5th -6th December, 2007 to honor Professor Jean Büttner-Ennever. With 87 contributions from international experts - both basic scientists and clinicians - the volume provides many examples of how eye movements can be used to address a broad range of research questions. Section 1 focuses on extraocular muscle, highlighting new concepts of proprioceptive control that involve even the cerebral cortex. Section 2 comprises structural, physiological, pharmacological, and computational aspects of brainstem mechanisms, and illustrates implications for disorders as diverse as opsoclonus, and congenital scoliosis with gaze palsy. Section 3 addresses how the cerebellum transforms neural signals into motor commands, and how disease of such mechanisms may lead to ataxia and disorders such as oculopalatal tremor. Section 4 deals with sensory-motor processing of visual, vestibular, somatosensory, and auditory inputs, such as are required for navigation, and gait. Section 5 illustrates how eye movements, used in conjunction with single-unit electrophysiology, functional imaging, transcranial magnetic stimulation, and lesion studies have illuminated cognitive processes, including memory, prediction, and even free will. Section 6 includes 18 papers dealing with disorders ranging from congenital to acquired forms of nystagmus, genetic and degenerative neurological disorders, and treatments for nystagmus and motion sickness.